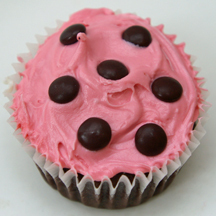 Here’s another twist on easy dotted cupcakes, this time in the popular color combination of pink and brown. What You Need: 1 cupcake; frosting tinted pink; mini brown M&Ms. How to Make It: Frost cupcake pink. Place mini M&Ms on top of cupcake with the M side down. This entry was posted on Friday, June 27th, 2008 at 1:14 am	and is filed under miscellaneous cupcakes. You can follow any responses to this entry through the RSS 2.0 feed. Responses are currently closed, but you can trackback from your own site.